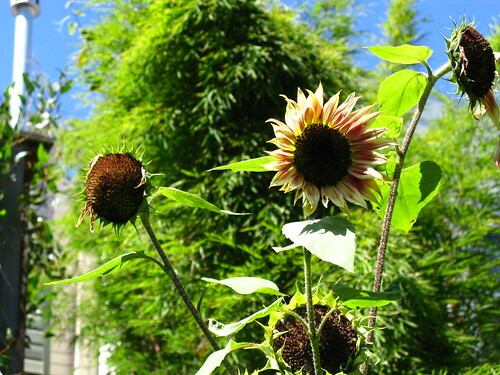 I don't have much to say about the garden right now, and it's too hot to spend much time in it anyway. 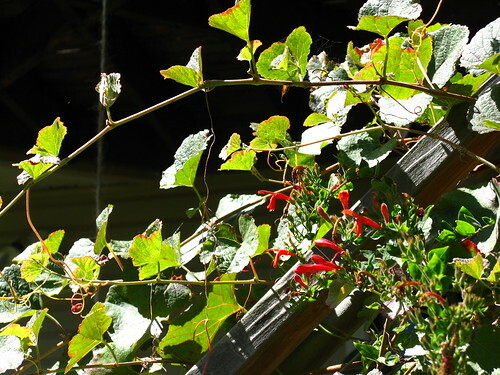 Keckiella cordifolia winds down at the end of the season and I cut it back as it does so. 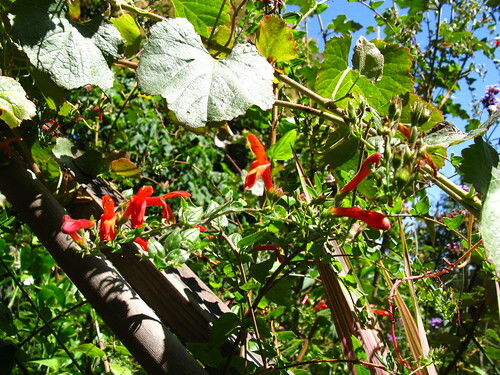 This is really one of the great California native plants. More Californians should grow it. I grew mine from seed a couple years ago, but you can find it at native plant nurseries and Annie's Annuals and Perennials. 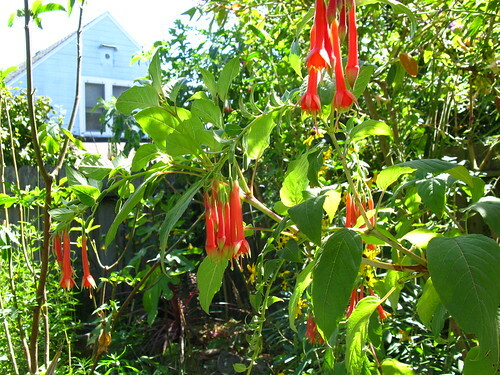 In SF, Keckiella starts to flower around June and has tubular red flowers until mid-September. Then it goes dormant. Cut it all the way back. New growth bursts forth with autumn rain. 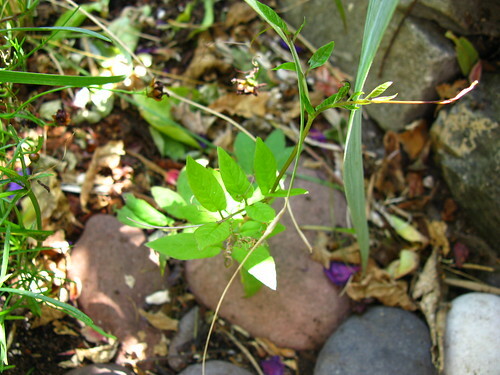 Long, arching stems thread through neighboring plants. This is the time for training and shaping if you have something in mind. Keckiella is lush green all winter and continues to grow through spring. And the coastal native purple angelica, Angelica stricta 'Purpurea'. I think I mentioned it before, but I have two and this one is much more purple than the other one. The other one is paler, almost mauve. I'd like to collect seed from these and grow a couple more for next year. Fall asters just getting started. This is Aster novae-angliae 'Skyscraper'. I've had mixed results with fall asters. The native Symphyotrichum chilense doesn't seem to like my over-amended soil. It grows like a weed and doesn't flower. I wild-collected some seed on the side of the road in Big Sur a few years ago (i.e., I pinched three seed heads, of thousands), with the same unsatisfactory result. 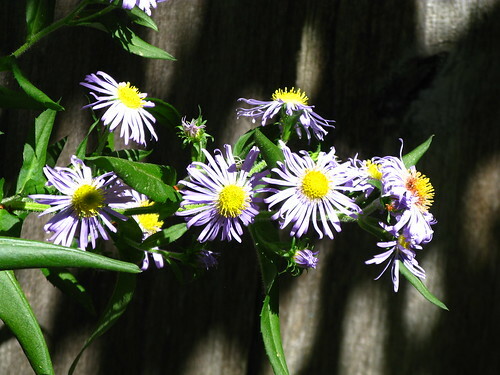 Well, I really like fall aster. I had to try this one when I read about it at Annie's Annuals. "[I]t easily reaches a very multibranching 5’ x 5’. Starting in midsummer & continuing throughout Fall, especially with deadheading, you’ll get a zillion 2”-3” amber-yellow centered, rich periwinkle blue daisies great for butterflies & for cutting for vases." Yes, please. Not 5' tall now, but it was new to the garden a few months ago. I like all kinds of aster family plants. 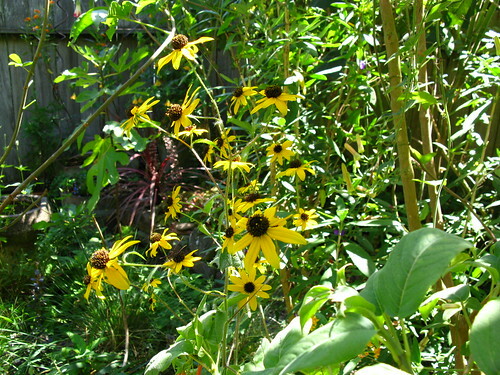 I grew Rudbeckia triloba from seed. I'd like to have a couple more of these too. I usually have more sunflowers than this, but I guess I missed out getting them started last spring. This sprout of Cobaea scandens surprised me. I don't know if this is self-sown, or coming up from the roots. I planted the original root crown three feet away from here, but I know the roots have since spread throughout the garden. Do you think this is new growth from the roots after the severe pruning I gave the vine last week? I wonder. It was hard to germinate this seed in a controlled environment with the seed trays on heating pads and regular water, but ripe fruit could have dropped right around here and received adventitious watering. Anyway, I'm not sure what to do with it... Train it to grow in the direction I want, I guess. Transplanting would be hard. There's only one place to put it, and that place is taken by the parent plant. Digging it out would be highly impractical. Your blog is fantastic and the photos exquisite. As a rather casual and inept native plant gardener, I am both envious and inspired. Which one smells the best? 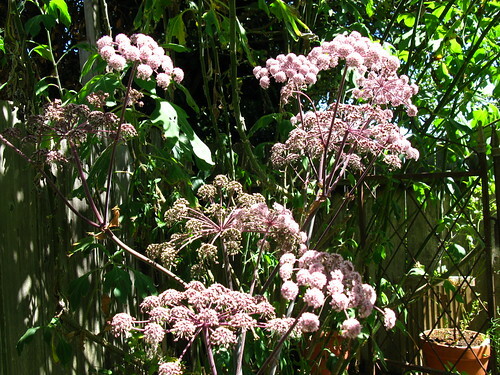 The photos of the Angelica stricta 'Purpurea' are very beautiful. I am going to use this in my next client project - you really made a nice case for a plant I haven't been mindful of. 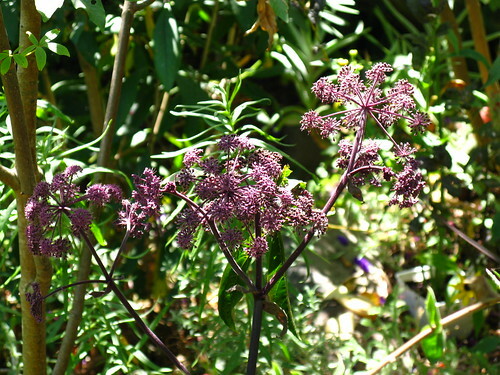 Hello,I live in Canada & would love to grow Angelica Stricta Purpurea. Do you know where I can find the seed? You have a BEAUTIFUL garden,thank you for sharing!! !